Conflict assessment is the essential first stage in the process of conflict management and resolution. 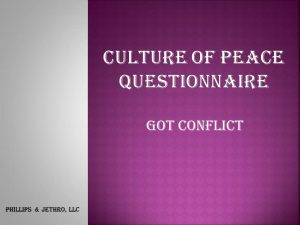 Conflict assessment is the essential first stage in the process of conflict management and resolution. A primary goal of such assessment is for all concerned parties to gain a deeper understanding of the dynamics inherent in their relationships. This understanding not only clarifies one's own interests and positions, but leads to an acknowledgement of the basis for the interests and positions held by others, and thereby promotes reflection by the stakeholders. The assessment maps the conflict, and then uses it as an evaluation tool to determine whether or not there is a reasonable possibility for initiating an intervention process to manage or resolve the dispute. 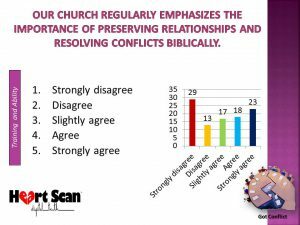 Church leaders use conflict as an opportunity to model peacemaking attitudes and behavior. My church is committed to obeying God’s teaching in Matthew 18: 15-20 and I Corinthians to resolve disputes in the church instead of running away or resorting to courts of law. Ministry leaders work long and hard to resolve disputes involving members of our church. Members of our church are committed to forgiving one another just as God, in Christ, has forgiven them. This church has successfully weathered most conflicts in recent years. Most leaders get the log out of their own eye before pointing out the faults of others. Senior leaders correct others gently and patiently. Our leaders are humble and approachable, and will listen readily to members’ concerns and criticism. I have a clear understanding of the basis biblical principles and procedures I should follow to resolve a personal conflict. If I had a personal, family, employment, business, or legal dispute with another Christian, I would try to resolve it through my church. With our digital keypad, the results of all assessment questions are captured electronically. The keypad provides an opportunity to speak the truth openly, anonymously and in love. The results for each question is instantly tallied then displayed for review and discussion. When an organization or church is in conflict, it is vitally important that current and accurate information is available; Digital Truth satisfies this need.